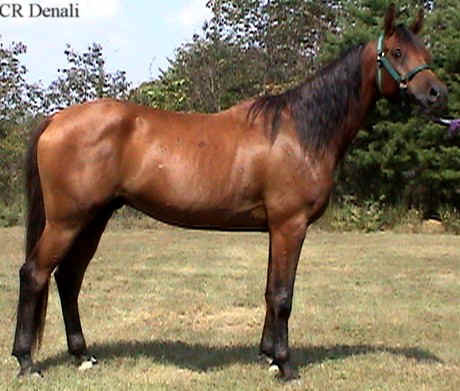 Supreme Temptation: Coming 8 yr old 16h 1/2 Arabian 1/2 Saddlebred. 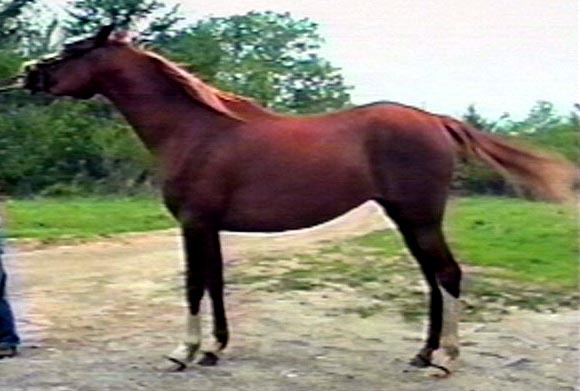 His sire, A Temptation, is pure Polish, and his dam is Dancin At The Ritz. This horse has fabulous recoveries and is absolutely pure fun to ride! He loves people. "Baluga" as we call him (after the white whale) is extremely gentle and not a spook on trail. He has done several 50s, including receiving high vet score, and always 100% sound, but his lifelong partner is one who wants to do limited distance with a great big fun horse! Breeders Sweepstakes. Baluga will be doing a 50 at the open ride at the US National Championship on Tuesday Oct 27th. Supreme Temptation just won the open 50 in 5 hours and got Best Condition AND high vet score! 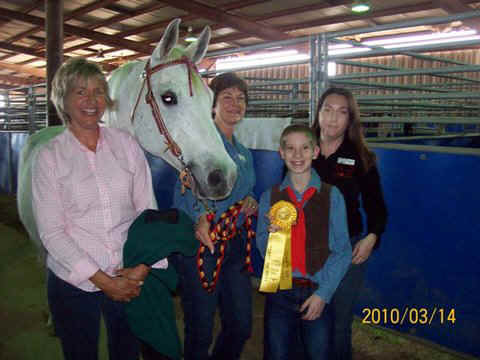 He has won two high vet scores in 4 rides! He also has outstanding talent for eventing! Supreme Temptation has found his perfect match with Marsha Greenway of Ohio! We are very sorry to hear Supreme Temptation passed away from PHF. I hope you find another to take his place in your heart Marsha. EVERY LITTLE KISS: 6 year old chestnut mare. 15+h, short back. Very sweet, kind mare. She just finished a hot, humid two day ride in Texas in excellent condition. Kisses is brave, has a super fast walk, and is very sensible. She loves to go down the trail, and will be excellent for a FW or LW who rides alone a lot. She will make a great 100 miler and she does not mind riding by herself. 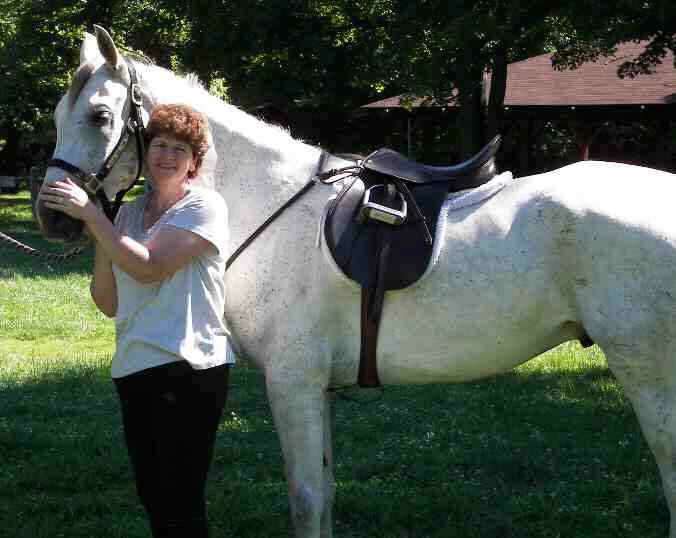 Kisses has just found an excellent home with Dorothea Meldrum in New York! feel free to e-mail her and ask her about our horses! THE NEGOTIATOR: HUGE 4 year old Chestnut gelding. Very suitable for a heavyweight rider, as this horse is going to be BIG! Calm, loves trail, likes to go up front. This horse is truly outstanding! Padrons Psyche, Exceladdinn grandson. Nitroxx: Gorgeous straight Russian 3 year old colt by Madison Avenue and out of The One Iment (Menes daughter). 14.3+ hands. Very solid boned. Beautiful head. Calm disposition and very willing to please. 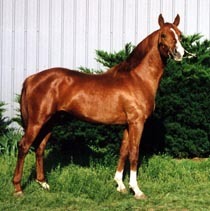 See bloodstock page for more information on sire and dam.Photo at age 23 months. 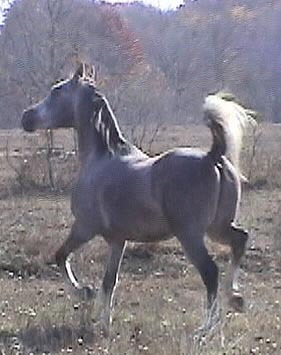 PassU 2001 straight Russian grey colt by Madison Avenue and out of MSA Magnollia. Our vet says this is the biggest Arabian colt he has ever seen! He is outstanding. PassU has been sold to Vanessa Waters, of New York kovat@juno.com , www.bentheyre.com . He has a great career as an endurance horse ahead of him! PROWLERR: 1-03-04. (Krakow x MSA Magnollia) see bloodstock. Very rare BAY straight Russian colt! This guy is a beauty! Four stockings and huge blaze and that gorgeous Russian trot. Big showy attitude already! He'll knock the socks off all the competition! Pirates Parley: We have 8 straight Russian mares, and this is the first filly we have offered for sale. She is a beautiful big 3 yr old chestnut. 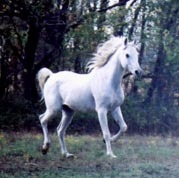 Parley is a second generation Straight Russian horse of our farm. Her sire is Nixx (Madison Avenue x The One Iment) and her dam is Magtika (*Statistic x Magna W) She is Menes on both sides. 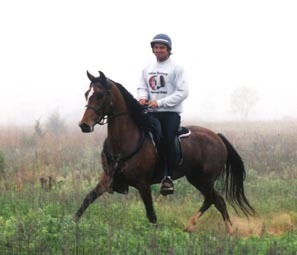 Both her sire, dam, and granddam have done endurance rides (see bloodstock and references). She is over 14.3 and her dam is 15.2, so we expect her to be tall. 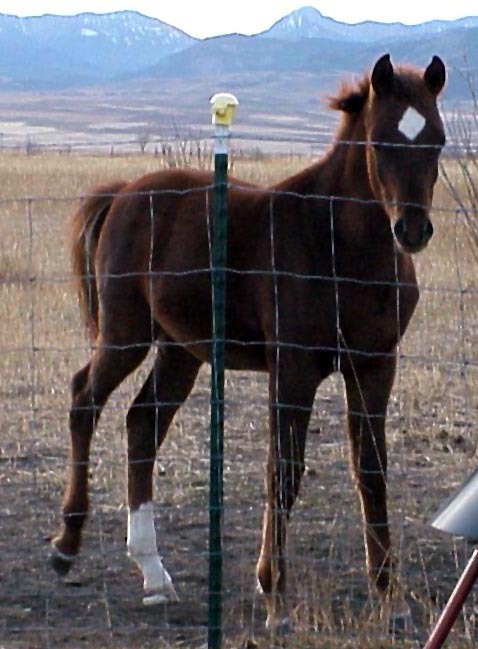 She is also a big bodied filly with big feet and straight legs. She has beautiful gaits, including that Russian trot! Parley has been started under saddle and she is very willing. She loves attention. We hate to sell her, as she is so nice, but she is not treated well in the herd and not happy. We would like to find a lifelong partner who will give her the confidence and attention that she deserves. She is a very nice mare and really wants to please. 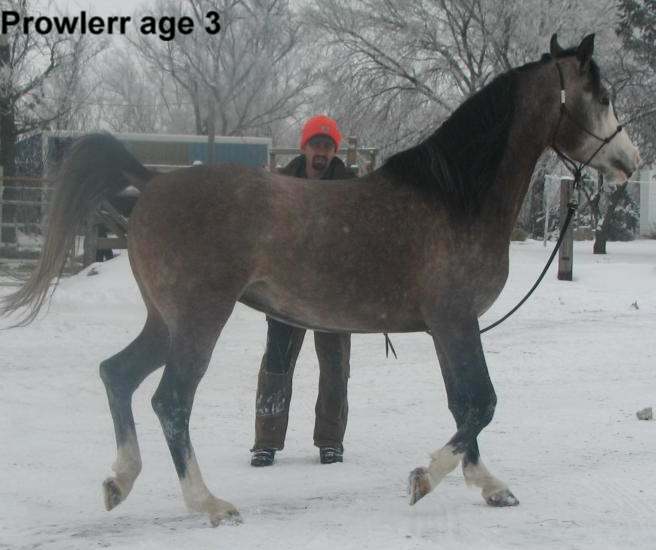 This is a steal for a Straight Russian mare of this quality, but we want to find her a new loving home ASAP. $4000 Parley is going to Daniel Sudilovsky, MD, of Siberia Farm in New York! She will make a great addition to their Russian breeding program! LS SIMPLY FANTASTIC: What a great cross! 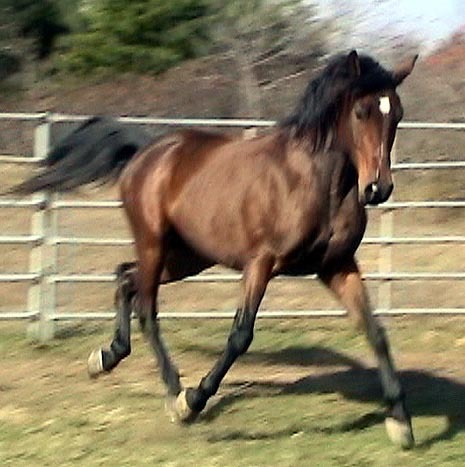 This six year old bay mare is half Arab and half HACKNEY HORSE, and can she trot!! She is extremely smooth and can trot like the wind! She is very willing on trail and has a great head set. Ridden by a heavweight. 15 hands. She is just starting her endurance career and she is going to be what her name implies...simply fantastic! 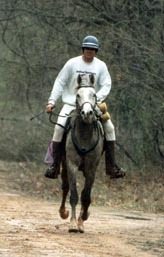 Congratulations, David and Phoenix for finishing the FLORAC IN FRANCE AND THE TEVIS ON PHOENIX!! Varykino: 5 year old 3/4 Russian Grey Gelding. 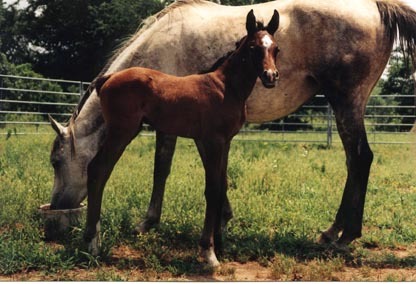 Outstanding Pedigree: *Othelloo son out of a *Mandat daughter out of a *Gdansk daughter out of a *Fortel daughter. Kino is a great horse. He has done two slow 25s with a heavyweight and tied for best vet score on his first 50! 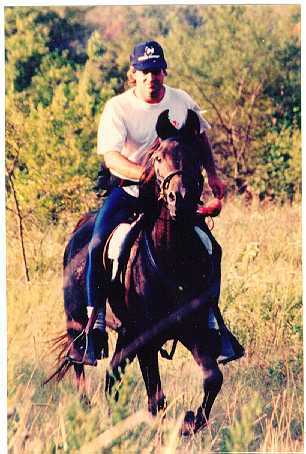 He loves to go in front or by himself and has wonderful gaits. He is calm and loves to please and is looking for that special owner to bond with. He actually gets depressed if you don't take him out! 14.3. Here is your horse that is Sound, Safe, Smooth, Sensible, and Short...but no "S" for Spook! He excells on mountainous or wooded trails. Meescha 15.3(really) grey 7 year old Russian bred gelding. *MAG son out of a *MUSCAT daughter. Great legs, outstanding movement. Loves, people, very gentle, but very competitive on trail. Put him in that Russian trot and watch the miles fly by! Won $6300 on the track as a four year old. Currently doing 50s and 100s with 210 lb. FLASH!! Just finished the TEVIS completely sound carrying 230 lbs and he came from the 8th furtherest away! And not only that, but top tenned in a ride three weeks afterward, obtaining the highest vet score on Soundness and Quality of Movement! This horse is GREAT and ready for a serious competitor! Congratulations Susan on your first 100!!! GHENT BBF 5 year old pure Polish gelding by *ERAN, a PARTNER son, out of GILDA, an AL BANAT daughter. Very solid 15+h. Excellent legs, great feet. Very pretty horse, with a great trot! Great back, excellent legs, never nicks himself. Extremely good base (headset, rounding) Loves people. Gillian Gourlay has already snatched up this one! 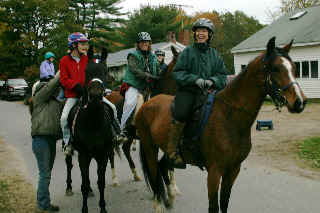 e-mail her at fraser.gourlay@cwix.com about Firedance Farms horses! 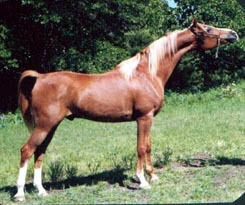 Summerffire 3 year old chestnut filly, four stockings/blaze. 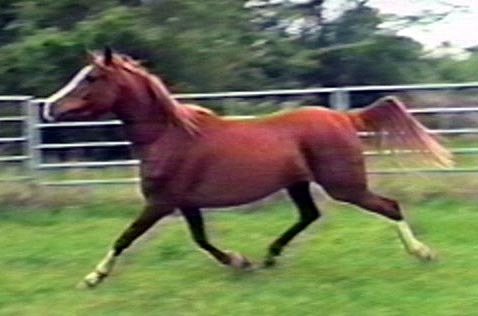 Both sire & dam were endurance horses. 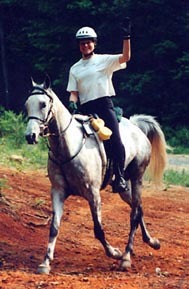 She is by SAVOY DSA, a 15.2h straight Russian who did over 1000 miles before his untimely death, and out of FARAH LENA+, a Polish/Crabbet mare who has done over 2000 miles and has her Legion of Honor in endurance riding, where she has won many awards, including high point Arabian in 1997. SUMMERFFIRE is very showy. She is energetic and competitive with a real "look at me" attitude. She has had a lot of ground work and been ridden by a ten year old. 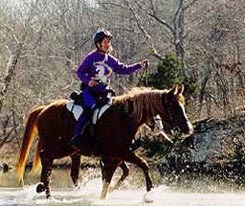 Summerffire is now owned by Dr. David Parker, parkerok@pldi.net. WESTWIN SIERA MCD 9 year old gorgeous chestnut gelding with an almost white mane!15.1 h slight build. Excellent legs, smooth gaits. "Broke to death". Professionally trained WP and halter, but loves to go on trails. Very gentle and responsive. No shies, likes to be out front, and happy riding by himself! Conditioning and ready to do slow 50s. Sweepstakes Nominated. TF SUMMER SONG 5 year old chestnut double *MUSCAT mare. Short backed, big rear end. Small 14.3. Absolutely perfect four legs. Currently doing slow 50s. She is outstanding on trail. Completely trustworthy; no shies, bucks, or bolts here! Very surefooted, never a lame step. Rides in a sidepull. Sweepstakes Nominated. Now in foal to FA AL BADI+/! She had a great colt by Fa Al Badi+/!! We bought this horse as an endurance prospect thinking he was 12 years old. Were we ever surprised to find out he was 18! This horse is WONDERFUL. Extremely well trained, and very loving. We would like to find a great home for him, perhaps one with young children, as he loves kids. You would never believe he was his age.Perfect health. 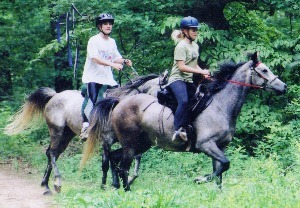 Absolutely loves trail riding. Not a spooky horse. Has done cows and dressage as well.